Game 2 of the EuroCup final takes place on Friday night and the hosts are drinking in the Last Chance Saloon. Valencia managed to win the first game of the final earlier this week but it is now the side from Malaga that holds home advantage and they will be desperate to make sure their 10,000 fans have something to smile about when heading into the weekend. We’ll either have a EuroCup champion tonight or we’ll be looking forward to a do-or-die clash to decide the title next week; which means that Friday night is sure to be a fantastic night for basketball lovers across Europe. It was a massive night for Valencia who now stand on the brink of clinching its fourth EuroCup title and a spot in next season’s Euroleague. Rafa Martinez made his 130th appearance in the tournament, which saw him equalling the record and of course, if Martinez makes his way onto the court on Friday night, he will hold the record by himself. It was a big record night for Valencia as two of their players moved into the top two scoring spots of all time for the tournament. Martinez managed to overtake the previous top scorer and finished the night with a total of 1,189 points in the EuroCup but the current record holder is Martinez’s team-mate, Bojan Dubljevic who sits on 1,190 points. These two players may end up having a shoot-out between them but as long as Valencia wins the game this midweek, no one on the away team will mind too much! Dubljevic grabbed 14 points on the evening while Joan Sastre provided 13 points in the win. Unicaja got off to a strong start in the game, holding a 7-17 lead at one point but the game was tied at 20-20 before the end of the first quarter and the hosts were in control from that point. Jeff Brooks provided 11 points for Unicaja in the defeat. Valencia know that they haven’t lost to Malaga this season, in the EuroCup and in the Spanish League, and that is a record that holds over five games. That will give them a degree of confidence heading into this game but there is also the fact that Malaga know that they are a good side and that they are likely to triumph at some point in the campaign against their rivals. The bookies think the hosts can tie the series but it is sure to be close. 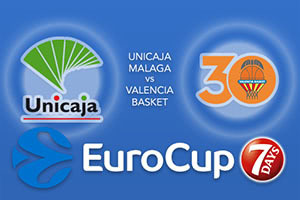 Take Valencia Basket at +2.5 which is available at odds of 1.90. If you’re looking for the Over/Under market, go OVER 146.0 which you can find at odds of 1.90. Bet Now!